Bring your curiosities about the intersection of robotics, fabrication, art, and design for the STUDIO’s first AMA (Ask Me Anything). Interdisciplinary artists and researchers Madeline Gannon and Maria Yablonina will briefly present on their recent work exploring the fringes of human-robot and robot-robot interaction. After the presentations, the floor will open up for an open discussion. So bring your questions about working with advanced robotics, curiosities about autonomous friends, and fears about the impending robot uprising. Maria Yablonina is an artist, researcher and designer working in the field of robotic fabrication with a focus on custom, task specific machines for making. Currently Maria is a research associate and doctoral candidate at the Institute for Computational Design and Construction at the University of Stuttgart. With a strong interest in robotics and digital fabrication techniques, she is currently focusing on exploring potential fabrication techniques enabled through introduction of architecture-specific custom robotic tools for construction and fabrication. Her work includes development of hardware and software tools as well as complementing material systems. Madeline Gannon is passionate about inventing better ways to communicate with machines. She develops human-centered interfaces that transform bodies into interactive canvases and robots into sentient companions as a way of illustrating the future of digital making. 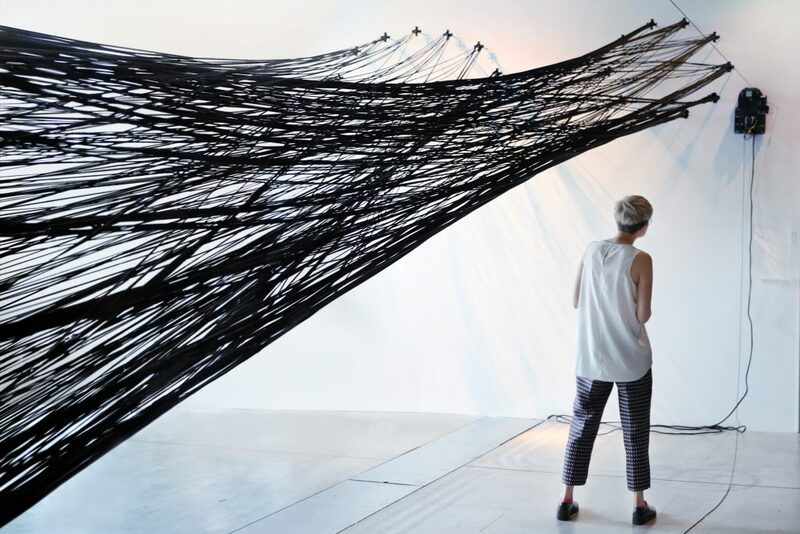 Her work blends disciplinary knowledge from design, robotics and human-computer interaction to innovate at the edges of digital creativity. Her work has been internationally exhibited at leading cultural institutions, published at ACM conferences, and widely covered by diverse media outlets across design, art, and technology communities. Gannon leads ATONATON, a research studio scouting the untapped potential of emerging technologies, and is a 2017 World Economic Forum Cultural Leader. She holds a Masters in Architecture from Florida International University, and is completing a PhD in Computational Design from Carnegie Mellon University. Molly Wright Steenson is an associate professor in the School of Design and is the chair of the Doctor of Design (D.Des) program. She researches the history of design, architecture, computation and artificial intelligence from the 1950s to the present, and is the author of the forthcoming book Architectural Intelligence: How Designers and Architects Created the Digital Landscape (MIT Press, 2017) that explores these linkages, with a focus on the practices of Nicholas Negroponte, Cedric Price, Christopher Alexander, and Richard Saul Wurman. At CMU, she teaches Seminar 1, the theory/concepts seminar for Master of Design students, courses related to service design, and doctoral courses. Molly holds a PhD in architecture from Princeton University and a Master’s in Environmental Design from the Yale School of Architecture. She was a resident professor at the Interaction Design Institute Ivrea in Ivrea, Italy, where she led the Connected Communities research group (early 2003–late 2004), and was an adjunct professor at Art Center College of Design in Pasadena in the Media Design Practices Program. From 2013–15, Molly was an assistant professor in the School of Journalism & Mass Communication at the University of Wisconsin-Madison, where she taught data visualization, digital studies, and led Mellon-funded research projects in the digital humanities. Molly has also worked with the web for 23 years at such companies as Reuters, Scient, Netscape, and Razorfish. She cofounded Maxi, an award-winning women’s webzine, in the 90s. As a design researcher, she examines the effect of personal technology and digital media on their users, including projects in India and China for Microsoft Research and ReD Associates for Intel Research.